As he watches his rookie driver Trevor Bayne work his way into a job in the Sprint Cup Series, Eddie Wood can’t help but think back to the days when he was just coming into his own as a mechanic on his family’s race team. 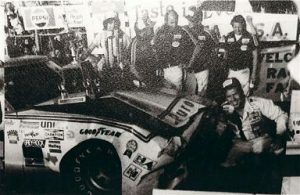 One race that stands above the rest from Wood’s early days as a full-time mechanic was the 1976 Daytona 500, a race that is rated by many as having the most exciting finish ever in NASCAR. 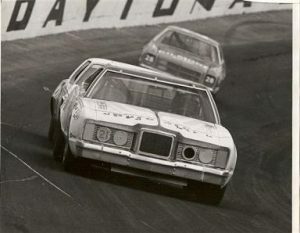 In that race, the Woods’ driver David Pearson drove a 1976 Mercury Montego. Eddie Wood, now a co-owner of the No. 21 Motorcraft/Quick Lane Ford Fusion driven by Bayne, remembers that the car arrived at the team’s race shop in Stuart, Va., as just a rolling chassis with the roof and quarter panels tack welded on. It was built up to that point by famed car builder Banjo Matthews, and it was up to the team to complete the car and prepare it for racing. Unlike today, where teams prepare fleets of cars to start the season, the Woods had just one car to build. And whereas today’s race teams have dozens of mechanics assigned to car preparation, the Woods handled that basically by themselves. Team founder Glen Wood, his brother Leonard, and Glen’s sons Eddie and Len had just one full-time employee besides themselves working in the shop. 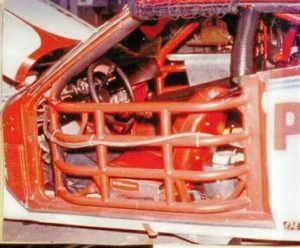 Eddie Wood, then 24, said he and his brother decided they’d like to paint the inside of their car something other than the dull flat black that it had been in the past. Their inspiration came in part from seeing their friends and rivals at Petty Enterprises paint the insides of their cars blue. Wood said the first color chosen for the Mercury’s interior was silver. “We painted it in the middle of the floor,” Wood said. But when it was done, it just didn’t look right. Wood said that experience illustrated how his uncle Leonard, who is still regarded as one of the brightest minds in the NASCAR garage, was patient with his nephews and willing to try their ideas on a race car. But, as Wood pointed out, Leonard’s primary focus was on that No. 21 and making it fast. And at the race tracks, when Len and Eddie would wander around the garage and check out other cars, Leonard never ventured far from the No. 21’s garage stall. For the ’76 Daytona 500, Leonard’s baby was one of the best in the field. A former Woods driver, A.J. Foyt led the most laps that day, but his Hoss Ellington Chevrolet blew an engine. Buddy Baker, who would eventually drive the No. 21, led 28 laps in Bud Moore’s Ford, but also blew an engine. But all the while, from the drop of the green flag, the two drivers at the head of the class were Pearson and Richard Petty, just as they were at countless other races and countless other tracks back in the day. As the laps wound down back in February of 1976, Pearson led from Lap 177 to 187. Then Petty led from 188-199. As usual for those times, Eddie Wood was the only team member in radio contact with Pearson. “Leonard was the crew chief and changed tires, and he didn’t want to be bothered with the radio,” Wood said. The cars went out of sight into Turn One. With no TV monitor and no vantage point providing a view of the backstretch, Wood and the rest of the people on pit road were left to wonder what was happening. As the cars roared off Turn Two down the backstretch, the crowd began to stand up. A roar was building. Pearson went high to the lead, but Petty came back on the low side. The two future Hall of Famers ran side by side, but a slight bump set in motion a series of events that have become an unforgettable part of Daytona and NASCAR lore. Wood looked to his right and saw Petty’s Dodge sliding through the grass toward the plane of the finish line. But he slid to a stop just shy of victory. It was a moment that clearly illustrated just how calm Pearson was in that situation compared to everyone else around him. “I couldn’t even find the button to push to answer him,” Wood said. And he won the Daytona 500, at about 20 miles per hour. Wood said that over the years, he’s watched replays of that finish, and come to appreciate even more just how calm the Silver Fox was in those critical moments. “When he asked me ‘Where’s Richard’ he was spinning,” Wood said. “He had clutched the car and was keeping it running, which was using both feet. He had to use one hand to push the talk button, which was on his shoulder harness, and he still had to steer the car. In the years since, moments like that have helped build a special bond between Pearson and Wood. But the story of that Mercury and David Pearson didn’t end with that finish. 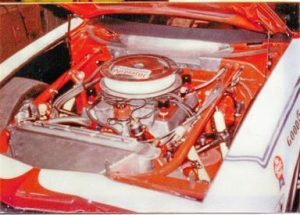 The car was rebuilt and Pearson drove it to victory in the sport’s other two big races that year – the World 600 at Charlotte and the Southern 500 at Darlington, all won with the same engine block that was in the car at Daytona. The car later served as a show car for series sponsor Winston, then ended up parked out back of the Woods’ shop in Stuart, made obsolete by NASCAR’s downsizing of the Cup cars. “We sold it for $200 just to get it out of the way,” Wood said. The car found its way to a junkyard in Florida, where it was rescued and restored. At last report it was on display in the Museum of American Speed in Lincoln, Neb.